Xcelerate is usually equipped with a drawer module. By storing products on top of each other, a high storage capacity can be achieved in a compact floor space. Width always costs money, whereas height does not. To load products into machines, they must also be offered to the system. Other products can be entered into the system during each load. This ensures that different batches can be produced one after the other, with up to four different batches in the standard Xcelerate configuration. There are also two different sizes of drawers for the two different Xcelerate models. The drawers for the X10 have dimensions of 1000 mm x 400 mm. The drawers for the X20 are larger: 1200 mm x 600 mm. The storage capacity of the X20 is therefore nearly 80% greater. Stepper motors push the drawers out of the frame in a smooth movement. The controlled movement of the drawers allows a wide range of product shapes to be loaded without needing to be supported. By stacking products (when the shape of the products allows it), you can have larger batches. Xcelerate can be delivered with different drawer and inlay combinations. This is entirely dependent on the format of the products. Not sure about what you have to do in two months’ time? In that case, Cellro has standard inlays. However, you can also create your own inlays that match products with unique shapes (as long as batches all have the same shape). It is important to determine with which inlays and with how many drawers you are able to run your production unmanned for as long as possible. Depending on your product mix, you can choose a loading configuration that best suits your production. If there is initially a taller product that you want to load, you can affix the bottom drawer of the system. This is easy to indicate this during the product configuration. Xcelerate’s modularity ensures greater flexibility. 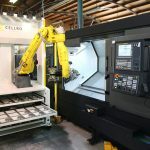 The inlays and fingers that Cellro delivers with the system are only the starting point of automation. 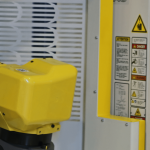 If you use the loading robot, you will see that you can tailor Xcelerate entirely to your production process. Fingers and inlays can be made for your unique production process. In this regard, you are not dependent on Cellro, as you can do this yourself. This is often the case in practice. Cellro will be happy to help you with this if you wish. Thanks to its modularity, no two Xcelerate units are exactly the same. Carts also form part of the standard package. Carts are used when a production process demands extra flexibility. The need arose when Xcelerate users wanted to the possibility of having a batch prepared while Xcelerate was busy loading the machine. In addition, it appeared that internal transport between different machines is simplified by unloading the raw products from other machines onto the cart earlier in the production process. You can then drive the cart to Xcelerate, where you dock it. At that point, Xcelerate knows – with the help of the installed program – where it can pick up and replace the products. After processing, it may be desirable to bring the processed products to a subsequent machine for post-processing (if required). This is easy to do with the cart, as the products have already been put back into place there. This solution pays off if you machine the same product on a regular basis. Xcelerate can continue working immediately after changing the carts. Because a cart is driven, the products must be enclosed so that they do not move about within the inlays. While this is not the case with the drawers, it is necessary for the carts. You will then also need a suitable inlay for each product. No cart has another cart on top of it. This makes it easy to present taller products or products of another shape to Xcelerate. The maximum product height for carts is 220 mm. Furthermore, a cart can carry a greater weight than a drawer. Are the products too heavy for a drawer when together? If so, a cart is a good alternative. 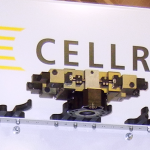 If you would like to know more about Cellro’s drawers, inlays and carts, contact one of our experts today. 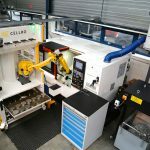 Previous post What are the advantages of the robot grippers and fingers for Xcelerate users? Next post What impact will robot automation have on my business?